Extremely rare, highly influential, and very important foundational map of the North Pacific showing Sea of the West and the apocryphal discoveries of Admiral de Fonte. Carte General Des Decouvertes De L'Amiral de Fonte Et autres Navigateurs Espagnols, Anglois, et Russes, pour la recherche du Passage a la Mer du Sud. An object of extreme historical importance and rarity, this map was the center of one of the most heated cartographic debates in history. This is an unrecorded state of Joseph-Nicolas de L'Isle's (Delisle) map of the Northern Pacific Ocean and Arctic. De L'Isle's map covers from the California coast northward to the Arctic Circle and from Hokkaido (Yeco) to Labrador. Much of the North American cartography here is speculative, and includes apocryphal passages through North America as well as a grand 'Mer de L'Ouest.' As we continue this description we will go over these cartographic anomalies in detail, but first it is important to put this map into his historical context. In the middle of the 18th century there were few places on Earth less known than North America's Pacific Northwest. This region had not yet been definitively penetrated by either overland explorers or navigators and as such was a tabula rasa upon which European power and intellectual luminaries alike imprinted their hopes and ambitions. One such was the expectancy of either an inland river passage or a Northwest Passage through North America to the Pacific, and thus access to the rich trading ports of Asia. Cartographers throughout Europe compiled sometimes dubious travel narratives, historical precedents, geological theories, and pure speculation into an assortment of maps and pamphlets intended to promote one idea or another about this this unknown territory. Nowhere was the debate more furious than at Paris's Academie Royale des Sciences. This map was engraved for one such pamphlet, Nouvelles cartes des decouvertes de l'Amiral de Fonte, et autres navigateurs espagnols, portugais, anglois, hollandois, françois et russes, dans les mers septentrionales, presented by Joseph-Nicolas de L'Isle in 1753. Joseph-Nicholas De L'Isle was the younger brother of the prominent French cartographer Guillaume De L'Isle. Where Guillaume attained cartographic fame and prestige in Paris, Joseph-Nicolas traveled to St. Petersburg where he found employ with the Tzar at the Russian Royal Academy. There he had access to records of then secret Russian voyages of discovery in East Asia undertaken by Spanberg, Tchirkow, Berhing, and others. In their serivce he compiled what is perhaps his only accurate map, a chart drawn for Du Halde illustrating Russian discoveries in Siberia. Guillaume de L'Isle (in Paris) meanwhile continued to speculate on the Pacific Northwest, attempting to compile and reconcile often conflicting information. In 1696 Guillaume De L'Isle, possibly with the aid of his father Claude De L'Isle, composed a manuscript map entitled Carte de la Nouvelle-France et des Pays Voisins. This is the earliest known map to show the Mer de L'Ouest or Sea of the West and as such it might safely be identified as the theory's birth-certificate. In this manuscript map, the Mer de L'Ouest appears as a revision of Verrazano's Sea, a speculative inland sea associated with Giovanni Verrazano's misinterpretation of the Pamlico Sound as seen from the sea just off Carolina's Outer Banks. Guillaume must not have had much faith in the idea of great inland Sea of the West because he never published it. Nonetheless, he did continue to play with the idea and, in the last years of his life, c. 1725-26, he composed another manuscript map, vaguely entitled 'Conjectures' (Ayer MS 293), in which the Sea of the West is reimagined much as we see in the present example. In this De L'Isle was no doubt responding to reports associated with the voyages of Juan de Fuca, Jean de Fonte, and Martin d'Aguilar. 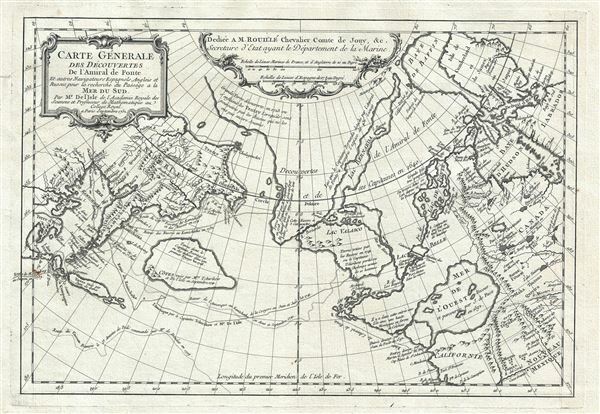 Guillaume de L'Isle died in 1726 and never published a map illustrating the Sea of the West. De l'Isle's notes and inventory fell into the hands of his son-in-law Philippe Buache, who put more energy into republishing Guillaume's established work than producing new more advanced maps. This began to change in 1747 when Joseph-Nicholas returned to Paris with new cartographic information from Russian explorations. Joseph-Nicholas meticulously culled through his brother's nearly forgotten notes and manuscripts and, combining them with his own reasonably accurate 1735 map of Siberia, compiled for Jean-Baptiste du Halde, produced a series of maps that revolutionized cartographic perspectives on the Pacific Northwest and incited a furious academic-political debate. The first result of these compilations was a c. 1750 manuscript map prematurely issued in 1752 by Philipe Buache, Carte Des Nouvelles Decouvertes au Nord de la Mer de Sud, in which the discoveries of De Fonte, De Fuca, and Aguilar are erratically and carelessly laid down. This map must have generated a rift between Buache and Joseph-Nicholas, because the latter enlisted Jacques Nicolas Bellin to help promptly issue the presently offered rebuttal map and immediately presented it before the Academie Royale des Sciences. In this map, the Sea of the West is reformatted considerably as are the networks of passages and inland seas associated with the De Fonte discoveries. Our study of the North American portions of this map will begin with the discoveries of De Fonte and Bernarda, seen here north of the Sea of the West (Mer de L'Ouest) and extending from the Pacific to the Hudson and Baffin Bay's. The tale of De Fonte' discoveries in the American Northwest is particularly entertaining. The De Fonte legend first appeared in a 1706 English publication entitled Memoirs of the Curious. This short-lived magazine published a previously unknown account by a supposed Spanish Admiral named Bartholomew de Fonte. De Fonte is said to have sailed up the Pacific coast of North America in 1640. On this voyage he apparently discovered a series of gigantic lakes, seas, and rivers heading eastward from the Pacific towards Hudson Bay. The De Fonte story relates how, on one of these great inland lakes, he met with a westward bound ship from Boston that must to have come through the Northwest Passage. At the same time De Fonte sent one of his sub-captains, Pedro Bernardo, northward to explore a 'beautiful river with deep calm waters.' This exploration led to the discoveries of Lake Valasco, R. Bernarda, and Lac Bernarda - as seen here. Today, based upon inaccuracies and falsities, most believe the entire De Fonte legend to have been a fabrication. Nonetheless, it set 18th century Europe afire with speculation that a Northwest Passage must indeed exist. Even such luminaries as Benjamin Franklin wrote long defenses of De Fonte. Further south the Mer de L'Ouest (Sea of the West) has been reimaged to conform more closely both to the journals of de Fuca and d'Aguilar, as well as to the manuscript maps of Guillaume de L'Isle. Entrances to the apocryphal sea are noted for both Martin d'Aguilar, who charted a 'swift flowing river' (the Columbia River? ), and Juan de Fuca (the modern day Strait of Juan de Fuca). Even de Fuca Pillar, today's Cape Flattery, is drawn in. Unlike the explorations of De Fonte, the navigations of Juan de Fuca and Martin d'Aguilar are most likely factual. The peculiar and enormous island in the North Atlanticjust east of Kamchatka bears some interest. This might be considered a proto-form of Muller's Peninsula. It was based upon sightings of the Aleutian Islands by Vitus Bering on his first voyage in 1725 and an actual landing by Tchirikow (Aleksei Ilyich Chirikov). Tchirikow sighted many of the Aleutian Islands on his 1741 voyage, but landed only once. Without fully exploring them, it is easy to understand how he may have imagined them part of a singular landmass. There is also an interesting note on this island that reads 'Cotes vue par Mrs. Tchirikow et De L'Isle en Septembre 1741.' Here Joseph-Nicholas is referring to his brother-in-law Louis de L'Islde de la Croyere, who traveled on the Bering-Tchirikow expedition, doubtless with the intention of passing on important new cartographic findings directly. By including his name in the annotation, De L'Isle is clearly suggesting direct access to privileged information - which in fact he had. This map was printed, as the date suggests, in 1752, by Joseph-Nicolas De L'Isle for publication in a pamphlet, Nouvelles cartes des decouvertes de l'Amiral de Fonte, et autres navigateurs espagnols, portugais, anglois, hollandois, françois et russes, dans les mers septentrionales, published to accompany his presentation on the matter of the Pacific Norwest to the Academie Royale des Sciences. The presentation created an instant sensation, reigniting the 'Mer de L'Ouest' debate and engendering many copies and counterfeits. The most notable of these is a map of the same title produced in 1772 by Didier Robert De Vaugondy for Denis Diderot as a supplement to his Encyclopedie. The Vaugondy map is quite common and did much to popularize Joseph-Nicolas De L'Isle's theories. According to Kershaw, there are two states of this map, both published about the same time. State one can be identified by the presence of an 'I' in the upper right. State two bears the text 'Iere Carte' in the lower left. The present example exhibits neither, identifying it as an unrecorded state. Wagner suggests that this map may have been issued separately before it appeared in Nouvelle Cartes though sites no such examples, due no doubt to extreme scarcity of the preliminary state of which map is certainly an example. Under high magnification, the rule guides on the original plate are still visible on this map - as they are on most examples though to a lesser degree. Typically these are filed out before printing and, in most cases are so fine that all traces wear away after just a few strikes off the plate, in this case they are particularly notable suggesting an extremely early strike - further supporting evidence that this appeared independently before printing for the pamphlet was initiated. This may even have been a proof. Despite its lasting influence and importance, this map, the source behind it all, is exceedingly scarce with no known presence in the private market in over 30 years. An extraordinary discovery and once in a lifetime collecting opportunity for anyone interested in the cartographic history of the Pacific Northwest. Delisle, Joseph-Nicholas, Nouvelles Cartes des Decouvertes de l'Amiral de Fonte, Et autres Navigateurs Espagnols, Portugais, Anglois, Hollandois, Francois & Russes, dans les Mers Septentrionales, avec leur Explication : qui comprend, l'histoire des voyages, tant par terre que par mer, dans la partie septentrionale de la terre, les routes de navigation, (Paris) 1753. Very good. Original pressmark visible. Light overall toning. Blank on verso. Kershaw, K. A., Early Printed Maps of Canada,, (vol 4), entries 1208 and 1209 (present state unrecorded). Wagner, H., Apocryphal Voyages to hte Northwest Coast of America, pgs. 29-38. Wagner, H., The Cartography of the Northwest Coast of America to the Year 1800, # 571 (copy of map inserted as plate XXXI between pgs. 158-159). Wheat, C. I., Mapping of the Transmississippi West, 1540 – 1861, vol. 1, map 131, p. 141 and 213 (Wheat uses Vaugondy example). OCLC 61556893. Tooley, R.V., Mapping of America, p. 35-36. Falk, M., Alaskan Maps, A Cartobibliography of Alaska to 1900, 1752-3. Howes, W., U.S.iana (1650-1950): A Selective Bibliography in which are Described 11,620 Uncommon and Siginficant Books Relating to the Continental Portion of the United States, D 244.